Here, the Board found, among other things, that VIUSA attempted to avoid the union by refusing to hire Teamsters-represented applicants who previously worked for its predecessor. Pursuant to the settlement agreement, VIUSA has agreed to pay $21.6 million; the NLRB will distribute approximately $14.4 million, as backpay, to about 257 former employees and individuals that VIUSA refused to hire because of their union affiliation. The remainder, approximately $7.2 million, will be distributed to the Teamsters Central States Pension Fund as compensation for VIUSA’s failure to make benefit contributions. This case highlights a key reason pay has stagnated for so many workers in America: the decline of union density. VIUSA sought to undercut the employees’ union in order to pay its workers less. Working people in unions use their power in numbers to secure a fairer share of the income they create. On average, a worker covered by a union contract earns 13.2 percent more in wages than a peer with similar education, occupation, and experience in a nonunionized workplace in the same sector. Higher union density also helps the pay of non-unionized workers—as an economic sector becomes more unionized, nonunion employers pay more to retain qualified workers. 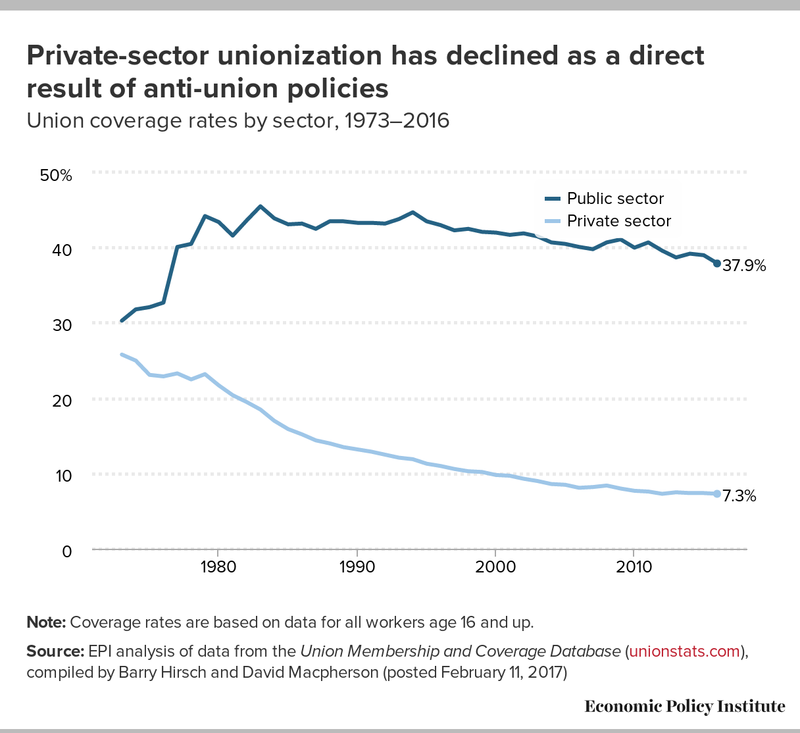 Accordingly, the private-sector union decline since the late 1970s has contributed to substantial wage losses among workers who do not belong to a union. Almost half (48 percent) of workers polled said they would vote to create a union in their workplace if they got the chance. But while so many workers want to join a union, the rates of the private sector unionized workforce continue to decline, in part, due to unlawful employers like VIUSA, who cheat the law to put corporate profits above working people’s paychecks. Many employers also fight unionization efforts by hiring professional anti-union consultants to bust their employees’ organizing drives with sophisticated anti-union campaigns—sometimes spending hundreds of thousands of dollars to keep their employees from joining a union. As shown in the table below, these anti-union tactics, in addition to aggressive lobbying campaigns to defund unions through deceptively-named “right-to-work” legislation, is part of the reason that private-sector unions are declining compared to their public-sector counterparts. As the VIUSA case proves, the NLRB’s role in protecting workers rights is hugely important. But so far, Trump has nominated management-side attorneys like William Emmanuel and Peter Robb to fill critical roles at that agency. The Economic Policy Institute’s Policy Watch project is tracking actions by the Trump administration that affect working people and the economy—and so far, his administration has sided with corporations over workers at nearly every turn.